Winamp: The death of the iconic MP3 player says a lot about the tech world’s vicious utilitarianism. I was distressed to read Wednesday afternoon that AOL plans to shut down its venerable music player Winamp come Dec. 20. (According to TechCrunch’s Frederic Lardinois, AOL plans to kill the Winamp website and will stop providing updates and support.) Many of you will likely be surprised that this software that, like Napster, you last fired up circa 2002 still exists in any form. But I took the news much harder: I use Winamp every day. While it’s true that Andrew Luck and I are the last two Americans who still use flip phones, I don’t use Winamp out of nostalgia or inertia—I actually like it much, much better than iTunes. It’s resource-efficient, it’s customizable—laugh about “skins” all you want, but there’s something to be said for putting design choices in the hands of the end user—and it doesn’t make me feel like it’s always trying to get my credit card number. I’ve got a lot of digital music files, and I’ve organized them in a very personal and completely unintuitive fashion. ITunes rejects my bizarre, free-associative taxonomy. Winamp handles it with aplomb. I’m sure I’m not the only person who still uses Winamp, and I’m more than a little aggrieved that AOL appears to have given it the ax so casually. I don’t even need updates: Just keep the website up so that I can download another copy if for some reason I ever need one. 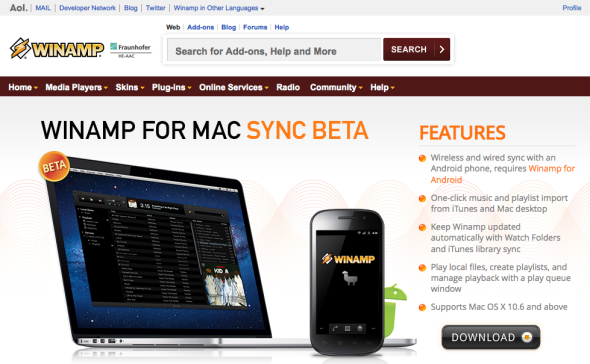 How much money would it have cost AOL to keep maintaining the Winamp website? How much is AOL saving by shutting it down? The answer to both questions is not much at all. There are other good, non-iTunes digital music players; AIMP is one of them. I’ll shift over eventually, if need be, and I’m sure I’ll survive. My objection here is more of a conceptual one. The shutdown of Winamp says a lot about the tech world’s vicious utilitarianism and its readiness to mock or eliminate applications and services that have fallen out of wide use. It’s the same mindset that led Yahoo to take Geocities offline in 2009. Yes, Geocities was garish and largely abandoned. But it was still a vital part of online history, a remnant of the clumsy, idiosyncratic Internet that predated today’s streamlined, circumscribed Web. And while it’s not a perfect analogue, Winamp is a part of Internet history, too. It was the first MP3 player for millions of people, and that means something. But not to AOL, I guess.